SHIRLEY ANN FALK, age 83 of Shenandoah, IA died Wednesday, April 3, 2019 at Corning Specialty Care Center in Corning, IA following an extended illness. Shirley was born January 15, 1936 to parents Presley James Glasgow and Mildred Wilma (Shere) Glasgow in Fremont County near Sidney, IA. Shirley was the second child born into the family. Betty Jean, Walter Allen, and Peggy Lucille were her siblings. Shirley went to school through the 11th Grade in Sidney. She married Dale Falk of Red Oak in 1972 and they were later divorced. Shirley worked many waitress jobs through her life and even waited on Marty Robbins and wife in Tennessee. She worked at the Tall Corn Cafe in Shenandoah and clerked there also at the front desk. 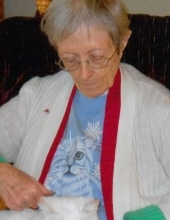 Later, she worked at Gardenview Care Center for several years eventually retiring from there. Shirley was a loving and kind person who loved life and loved God with all her heart. She always said God put a lot of good friends in her live through the years. She loved all of her nieces and nephews and was like a second Mom to them. She loved all animals, especially the four legged furry kitties, most significantly "Miss Kitty" who was very vocal with her Aunt Peg. Shirley and her sister, Peg, has a lot of fun all their lives. She loved music, dancing, cars, and roller skating. When they were teenagers they decided on taking her old Ford to Grand Island, NE but after adding oil in each town along the way, they decided that was enough of an adventure. Shirley was preceded in death by her parents; sister, Betty Reed; brother, Bud Glasgow; sister-in-law, Judy Glasgow; brother-in-law, Bill Hayter; nephew, Zachary Hayter; and former husband, Dale Falk. She is survived by her sister, Peg Hayter of Corning, IA and friend Kenny Johnson; brother-in-law, Bob Reed of Sidney, IA; nephews, Kerry and Galen Reed; nieces, Candy Norris and husband Brett, Lori Sturm and husband Tony, Paula Brackney; and Dawn Brown and husband Brian; many other relatives and friends. Memorial services will be 11:00 AM Saturday, April 13, 2019 at the Crawford-Marshall Funeral Chapel in Sidney, IA with Pastor Craig Eberly of the Sidney Victory Life Church officiating. Visitation with the family greeting friends will be from 10:30 AM until service time on Saturday. A memorial fund has been established and interment of ashes will follow in the Sidney, Iowa Cemetery. The Crawford-Marshall Funeral Chapel in Sidney, IA is in charge of arrangements. To plant a tree in memory of Shirley Falk, please visit our Tribute Store. "Email Address" would like to share the life celebration of Shirley Falk. Click on the "link" to go to share a favorite memory or leave a condolence message for the family.